When we were discussing this experiment, it wasn’t obvious the best way to measure how “well” a car was dyed. One thought was to photograph the cars and measure the change on the RGB scale, but this would require a lot of work with photography, and we usually had some sense as to the goodness of the coloring just by looking at a car. 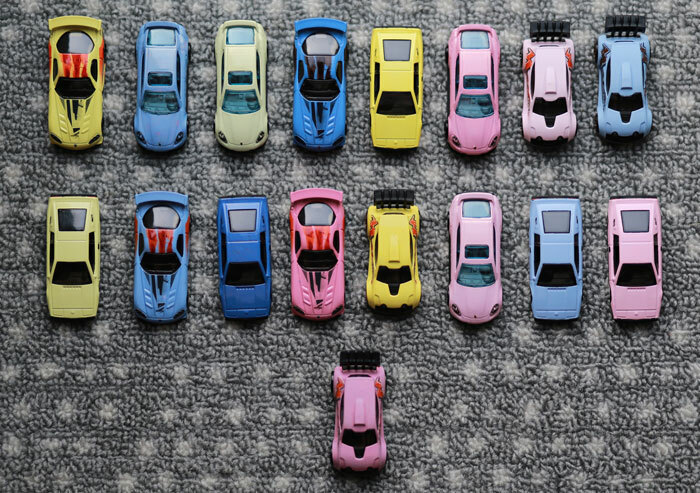 If we have a subjective response, the cars can all be compared side-by-side to make them relative to the others. In the end, we had three people give a forced ranking on the 17 cars with 1 being the best and 17 the worst, where the basis of comparison was how close the advertised color the car was. The final response was the average of these ranks. In setting up the analysis, it also became apparent that car should be a random effect instead of a fixed effect. If we dye cars in the future, we will most likely not be using the same castings used in this experiment, and we want to find a dyeing method that we can use in the future as new castings are released. When I go into the Fit Model platform, I can do this by selecting Attributes -> Random Effect with Car selected in the Model Effects list. It turned out that it was enough to fit the main effects model for this data. I tried adding interactions, but nothing came up as warranting further investigation. It turned out that the amount of dye and length of time didn’t seem to make much of a difference, but using the solid dye showed a noticeable improvement, and that the different color of dyes have varying effectiveness. In particular, we found that the blue dye was the most effective, followed by yellow, and that it was difficult to get good coloring with red. My father and I were both surprised at the results, in that many others dyeing these cars have been moving toward the liquid form of the dye. Admittedly, this is in part due to convenience, as mixing the liquid form is much more forgiving with splatters during mixing (a word to the wise – if you try this at home, use lots of newspaper). I think there’s still room for improvement, so I’ve started to pick up some cars for a future experiment. Any readers have experience with their own dyeing of objects? Please leave me a comment and let me know your thoughts. Thanks for reading!